Those other vampires — the Dark Society — want him dead. And he wants to get close to them, not solely to destroy them, but also because he believes that the female who turned him holds the cure for his vampirism. He gets his opportunity when David Kingsley comes to him with news of a kidnapped daughter and a plea that Lawson personally retrieve her, as the ransom note demands. And so Lawson heads for the swamps of Louisiana with the demanded ransom of 666 gold pieces, to a town called Nocturne, which is on no maps, but can be reached from the hamlet of St. Benadicta. In the rainwashed city of New Orleans the gas lamps hissed, the barkeeps offered exotic drinks from potion bottles of many colors, the restaurants served Creole and Cajun fare that put heat into the stomach, blood and loins, sweet ladies paraded and posed before young gentlemen seeking an evening of delight, laughter rose up from shadows and then fell back into darkness again, horse-drawn carriages moved here and there in no particular hurry as if the night had no beginning nor end, guitar and piano music spilled into the puddled streets from rooms made golden by candlelight, the timeless river washed against the piers and pilings of exquisite decay, and the brick walls that had stood in the rein of the Ibervilles still stood in defiance of sun, wind, the dampness of the swamp and the hands of modern men. This is cinematic prose; you can feel the heaviness of the humid air and hear the clopping of the horses’ hooves. The quoted sentence is representative of McCammon’s writing, which stays lush throughout, even in describing the horrors of fights between vampires. In the process, we learn the details of Lawson’s past, from his marriage to his decision to join the Confederate Army in its fight against the Union, to his turning and his battles and compromises with his new nature, to his hope for a cure. The beautiful language and the exposition are in service to the story, not a barrier to it. 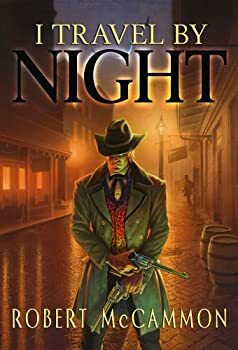 McCammon doesn’t stint on the action or the violence; his writing remains so clear that the reader can follow every move of every battle. And McCammon also finds a new twist to vampires in the notion that vampirism can be cured, and in the means of that cure. If you thought the last few decades had exhausted the topic of vampires, think again. McCammon’s vampires are evil to the core; you will find no romantic Lestat and no sparkling Edward here. What you will find is horror written so exquisitely that you feel every piercing, every blow. Make the time to read this novella in a single sitting to get the full effect. Read slowly, with a mint julep at your elbow, and relish the work of a master of dark fiction. Great review. I was wondering about this book cause I used-to read a lot of McCammon’s books back in the early 90’s. I highly recommend his book Gone South. Gone South is bizarre and wonderful. I haven’t read a ton of McCammon’s work — yet — but I really enjoyed Swan Song and thought Boys Life was a little bit of genius. I’m looking forward to reading more, especially after reading this novella. I have several McCammon books on my shelf but have yet to read any. This sounds like another to add to the pile.